President Sirleaf making remarks in West Point. Monrovia, Liberia - President Ellen Johnson Sirleaf on Wednesday, May 11, 2016 visited hundreds of disaster victims and residents of the slum community of West Point, who were made homeless by sea erosion and assured them of government’s continued support. According to an Executive Mansion release, President Sirleaf made the statement at the Administrative Building when she led an array of senior government officials to the affected area to identify with victims of the sea erosion and residents that rendered several West Pointers homeless. “I want to thank you for your patience, calm, peacefulness and sense of discipline exhibited despite your state of homelessness caused by erosion while awaiting government’s intervention” President Sirleaf Said. 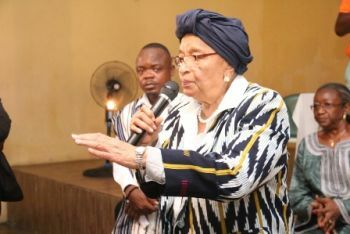 President Sirleaf said government is concerned about the situation and has embarked on the construction of temporary homes in the VOA Community in Virginia, outside of Monrovia for the relocation of the homeless victims. She said the initiative was in response to their request for government’s intervention to accommodate them ahead of the heavy rainy season. President Sirleaf said the people of West Point will be relocated gradually, starting with the families of those who have lost their homes because according to her relocating the entire West Point will take government some time. The Liberian leader informed the audiences that the problem of the sea results from what she termed climate change - something she said “we” cannot change. “That one that God’s work. All over the world the seas are moving up. The seas are getting stronger. The sea is moving and taking land from all over. It’s not just unique to West Point alone. All over Liberia, the same problem happens” she emphasized. The Liberian Chief Executive indicated that the people of West Point should be ready to change to be able to move somewhere else and start something better where the sea will not affect them again and to avoid the kind of congestion experienced in the township. President Sirleaf, donated 100 bags of rice, used clothes, LD$30,000.00 and other assorted food items to the homeless residents. She also thanked the local government officials in the township who stood by the victims after the incident, as well as others in the community who have personally been able to reach out to the affected families to offer them some help. At least 4000 people were made homeless last month as a result of the sea erosion that hit West Point. Also Speaking, Prince Wureh, Deputy Managing Director for Technical Services, National Housing Authority (NHA) said about 1,779 families, who “voluntarily signed a petition” seeking relocation, will be repatriated to a new location behind the VOA Community of Virginia in Montserrado County. The NHA Deputy Managing Director said the process has started to relocate the affected sea erosion victims and residents in facilities comprising of two bedrooms, a kitchen and bathroom being built as temporary homes with support from the United Nations, while the government is expected to erect permanent structures that are expected to shelter them. He told residents of West Point that the government’s action is temporary to quickly relocate the victims before more homes are swept away by the sea. For his part, the Commissioner of the Township of West Point Mr. Sampson Nyan thanked President Sirleaf for the timely visit and assured her of West Pointers’ fullest cooperation in whatever initiative undertaken by the government. The residents, including children, lined up along the narrow street of West Point as President Sirleaf and entourage drove through the township. The President was accompanied to West Point by Information Minister Eugene Nagbe, Commerce Minister Axel Addy, Gender Minister, Julia D. Cassell, Monrovia City Mayor, Clara Doe Mvogo, among others.